WASHINGTON (Feb 21, 2017)— Combat veteran, Purple Heart recipient and U.S. Sen. Tammy Duckworth (D-IL), M.A. ‘92, will deliver the George Washington University's commencement address before an audience of approximately 25,000 graduates, friends and family members on May 21. 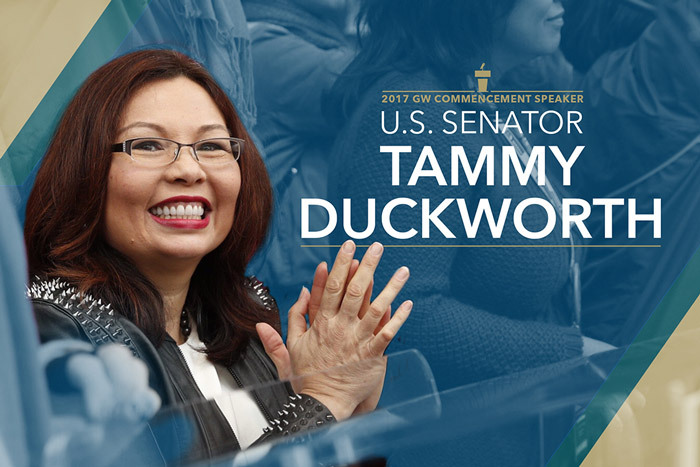 The ceremony will be held on the National Mall in Washington, D.C.
"Sen. Duckworth is one of the George Washington University’s most distinguished alumni. From her military service to her tireless advocacy on behalf of veterans, women and families, Sen. Duckworth has dedicated her life to serving her country. She embodies a spirit of service and sacrifice that has inspired our many GW veterans and our university as a whole,” said George Washington University President Steven Knapp. Sen. Duckworth was elected to the U.S. Senate in 2016 after serving two terms in the U.S. House of Representatives. While serving in the U.S. House, Sen. Duckworth was a member of the House Armed Services Committee and helped pass several policies to help veterans, including the Clay Hunt SAV Act to help reduce veteran suicide and improve veteran mental health services and the Troop Talent Act that helps returning veterans find jobs in the private sector. As a U.S. Senator, she is continuing her lifelong mission of supporting, protecting and keeping promises made to veterans. Sen. Duckworth is a former assistant secretary of the Department of Veterans Affairs and was among the first Army women to fly combat missions during Operation Iraqi Freedom. A member of the Reserve Forces for 23 years before retiring in 2014, she became an advocate for her fellow soldiers and others with disabilities while she was recovering at Walter Reed Army Medical Center from combat wounds she received after her Black Hawk helicopter was hit by a rocket propelled grenade. Since her recovery, Sen. Duckworth has resumed flying as a civilian pilot and has run in several marathons to raise money for patients recovering at the Walter Reed Medical Center. Sen. Duckworth earned her bachelor’s degree from the University of Hawaii and earned a Master of Arts degree in international affairs from the George Washington University. Since her graduation from GW, she has continued to be an active member of the university community. In 2014, she received GW’s distinguished alumni achievement award and in 2009 received the university’s inaugural Colin Powell Public Service Award. She most recently served on the host committee for GW’s annual Capitol Hill Alumni reception held in January. The George Washington University is the only university to hold its graduation ceremony on the National Mall, and this year’s ceremony will take place on the grounds of the Washington Monument. In addition to the all-university Commencement ceremony, individual schools and colleges will hold ceremonies May 15-21. Previous GW Commencement speakers include Apple CEO Tim Cook, award-winning actress and alumna Kerry Washington, former New York City Mayor Michael Bloomberg, then-First Lady Michelle Obama, former President George H.W. Bush and former First Lady Barbara Bush, then-First Lady Hillary Rodham Clinton and world-renowned chef and humanitarian José Andrés. Additional information about GW’s Commencement. Follow GW’s Commencement on social media with #GWcommencement and #GWClassof2017 and @gwtweets and @SenDuckworth on Twitter.